From Ron Gold at The Invisible Pink Unicorn comes this gem. Read his post for more info, but here’s the summary. 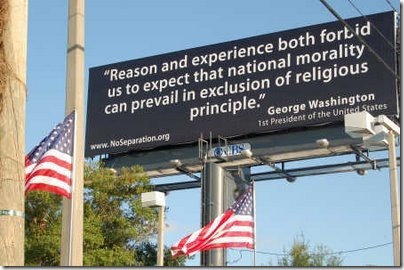 The Community Issues Council is putting up billboards across Florida similar to the one pictured below. Where’s the lying bit come into play? Here’s a statement by Terry Kemple, the group’s local chapter president, where she refers to a billboard with the quote "It is impossible to rightly govern the world without God and the Bible" attributed to George Washington. I don’t believe there’s a document in Washington’s handwriting that has those words in that specific form," Kemple said. "However, if you look at Washington’s quotes, including his farewell address, about the place of religion in the political sphere, there’s no question he could have said those exact words. So they’re making up at least one quote about church/state separation issues and falsely attributing it to our first president. So not only are they attempting to discard the establishment clause of the second amendment, but they’re lying to do it. …but they’re doing the Lord’s work.